Last week in my post about Washboard Abs on a High-Fat Diet, No Ab Workouts and No Cardio I got a number of questions regarding my diet. So here it is. I’d recommend everyone visiting FitDay and giving it a try. I know when I have clients send me their FitDay records, it’s usually an eye-opener. As noted in the previous post I am getting well over 50% of my calories from fat and am right at 1 g protein/lb. I try to keep my carbs at 100 grams a day plus or minus a few. This keeps me in a predominantly fat-burning state without ever being ketogenic (in the strictest sense). This is an important concept. Low carb does not necessarily mean ketogenic, as some people seem to believe. The above figures correspond with the following foods and serving sizes. Though the vegetables and meat choices often change from one day to the next it is very typical of my diet. One notable thing here: Despite eating a diet largely based on nutrient rich vegetables, healthy fats and some fruit it is still possible to not meet RDA of some vitamins and minerals. In this particular case I came up short on Vitamin D and Calcium. This is precisely one of the reasons why I spend some time in the sun each day and why I choose to take a multi-vitamin supplement. Sometimes even a great diet won’t meet all of your needs. Thanks for posting… great info. 1. What kind of physical activity or exercise did you perform on this day? 2. how many cals did you burn while exercsising? 3. net calories total for day after cals burned from actvity? Just curious… I am an endurance athelete and still experimenting with how many calories work for me based on activity/exercise level. Get Post, thanks for sharing your Fitday profile. I check you blog at least once /twice a day, cross post on mine along with posting articles on our company bulletin boards. That’s an interesting self study. 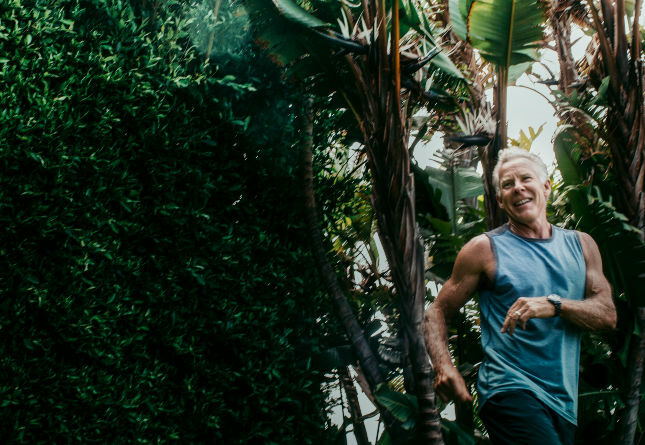 I have recommended Fitday to patients of mine for years and many find it a pleasurable way to study one’s eating habits. If you don’t mind, I think that you should do this for about 2 weeks and make your results public on Fitday. It would be interesting see any trends that break out over a 2 week period rather than sampling just 1 day. It would also be easier to look at rather doing a screen capture and putting it on your site. Thanks for posting, but it is really hard to read what the “Today’s Foods” says. Anyway you could make it more legible? Right click the photo and select “view image” (PC). This should allow you to view the capture in a new window at actual size. Not sure what the commands are on a Mac, though. Mark, I actually started putting my food intake into FitDay a couple days ago as I’ve never examined it that closely to know my breakdown. Your abs post prompted it. I assumed I was around 50% fat, 30% protein, 20% carbs. I assumed wrong! Monday I came in around 70% F, 18% P, 12% C, and yesterday flipped the P and C numbers a bit with a sweet potato. Very interesting stuff…amazing I’m not dead with my 21% saturated fat yesterday. I noticed just 1 cup of milk would easily get you out of the red on the only 2 nutrients you seem to be lacking (Vitamin D and calcium). Any specific reason you steer clear? 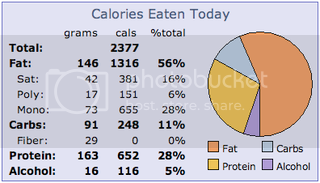 My fitday calcs seem to indicate that their “egg, fried” includes the butter already. Or are you adding more than they specify? 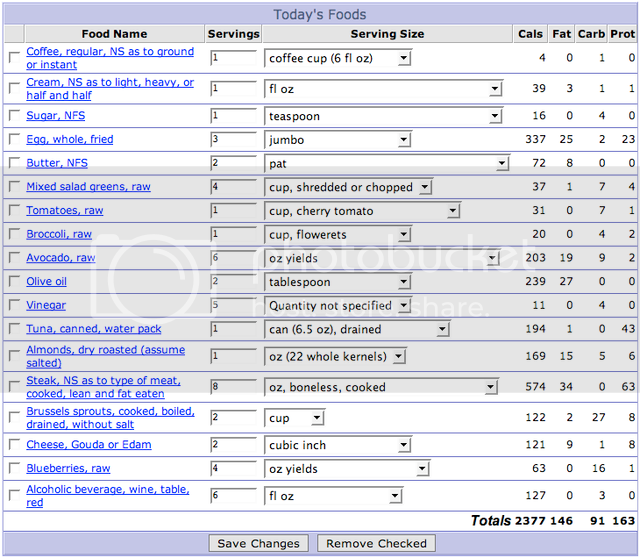 Good breakdown…honestly that seems like the perfect ratio of macronutrients for health…even of sat/mufa/pufa fats. Well done sir, no wonder you have abs! Wondering if you eat more carbs (fruit, sweet potatoes) on a day of vigorous activity? Mark, whats your cholesterol like? Good questions, all. Just got in off the golf course (foraging for lost golf balls, while carrying a bag and swinging a stick). 1) Physical activity on that day was extremely hard 30 minute stationary bike ride. 2)Irrelevant how many calories I burn during exercise. That’s a problem with FitDay because they overestimate your “burn.” FWIW, I burned 675 calories in a half hour according to the bike. Net calories don’t faze me either. Metabolic advantage evens everything out. 3)Don’t drink milk because our ancestors didn’t, and I hate the stuff. But I do consume rotted milk in the form of cheese. Go figure. 4)2 Pats of butter covered the eggs at breakfast and the brussel sprouts later in the day. 5) Less than 35 grams of fiber is all I need to stay regular. I have never felt better since I got rid of supplemental fiber (and whole grains). 6)I don’t eat more carbs on a vigorous day generally because I don’t have days where I exercise more than an hour. So I just don’t ever need carbs beyond my 100-150 per day. When I do go longer (a long hike) or a 3 hour game of ultimate, I still don’t compensate with extra carbs since I likely won’t be doing it again the next day and I know my glycogen stores will fill from just the protein/fat and low carbs over the next 48 hours. 7)Last I checked (life insurance exam) total cholesterol was 187, HDL 82, triglycerides 70, A1C 0. 8) I use regular sugar in the coffee (and heavy whipping cream) Gotta make it worth drinking. Just got in off the golf course (foraging for lost golf balls, while carrying a bag and swinging a stick). I enjoy golf so much more now that it’s major function is exercise rather than worrying about lowering my handicap (which I’m NOT doing). Learn to appreciate and then pull your own perfect espresso. It is one of my great enjoyments in my life and it is guilt free. Seriously, putting any type of dairy or sweetner into great espresso is nothing short of a crime. I notice on my reports that I’m not deficient in vitamin D and Calcium, but if I remove the 1 can of sardines that I eat most days, I am. Something worth noting is that those yummy little fishes (with the bones of course) contain both of these vitamins/minerals and a single 3.75oz can will bump you up to or above the RDA. 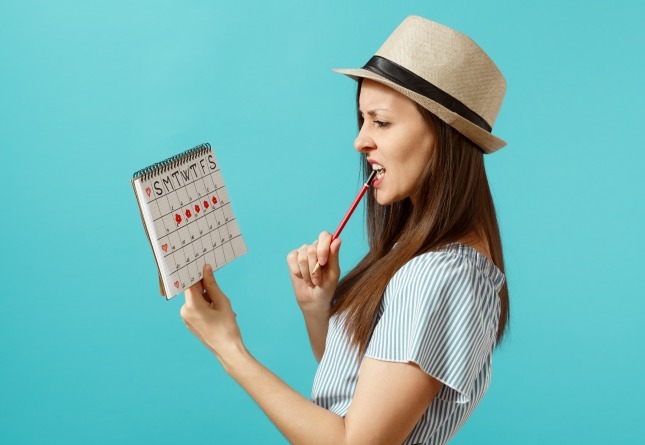 The thing I find most interesting is that I maintain my 115-120 pounds (on a 5’4″ frame, after having had 3 children) on about the same number of calories per day as Mark, without much in the form of “formal” exercise (up and down playing with the kids, gardening, housework and such), and my balance of carbs and protein is about exactly the opposite. Lots of fruit and whole grains around here, and it sure doesn’t seem to be hurting any of us. Not trying to be totally antagonistic to the whole “primal” thing, but it surely is not the only way to go, and I enjoy my diet a lot more than if I was eating the “primal” way. And it just doesn’t sit right with me to preach a “primal” diet like the one “Grok” ate while consuming the milk of other animals in any form. Don’t get me wrong – I LOVE my cheese, yogurt and ice cream – but Grok wouldn’t have been eating any of those things. I’m just curious (maybe it’s been addressed before) how you decide which concessions to make and where to “fudge” the rules on the limits. You are correct. Grok didn’t drink milk or eat cheese (or drink wine or a protein shake). Here at MDA we espouse a Primal Blueprint “style” of eating. Ideally, you’d get up with the sun, go to bed when the sun goes down, hunt for animals and forage for veggies in your neighbor’s garden. Unfortunately, modern life interferes with that idealistic style. So we make compromises. We call them “sensible vices” https://www.marksdailyapple.com/index.php?s=sensible+vices or “minor indulgences” that let us enjoy trappings of modern life without too much sacrifice. Generally, these also have research to back the fact that they have either health benefits or at the very least don’t have a heavy downside. I don’t drink milk or eat ice cream (even though I consumed a half gallon a day for ten years in my youth). I do eat a little cheese now and then, arguing that it contains some protein and fats that I can easily digest (and it tastes good). I also have a little red wine a couple of times a week as a compromise from all the beer (liquid grains) I used to drink. I drink a protein shake when I’m in a hurry and need a decent compromise. While all these are slight compromises in the types of food, I still adhere pretty strictly to my overall desire not to raise insulin much and, therefore, limiting carbs is my main mantra. And that is the defining characteristic of Primal eating. 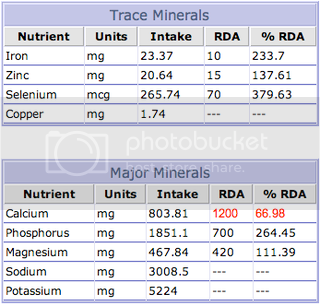 My micronutrient breakdown looks quite a bit like yours, except I’m usually OK on calcium. When I saw this, I gave up my multivitamin. I don’t sweat the vitamin D when it’s warm enough to get a little sun (I have light skin, so it doesn’t take much exposure), but I take some cod liver oil in the late fall, winter, and early spring. When I first experimented with low-carb back in 2002, my doctor insisted I would develop a vitamin C deficiency. When I found Fitday a year or two later, I laughed my (_|_) off when I saw that I was consuming 250% of the RDA just by eating cabbage and peppers. Here’s a question – I wonder if anyone can answer this. My B-vitamin profile looks almost exactly like yours – barely squeaking by on thiamin, somewhere between 100 and 200% on folate, substantially more than the requirements of all the others. And we’re both getting this naturally through diet. The B vitamins supposedly work as a complex. I remember a couple of things from high school health classes: a) the RDAs were set by figuring out how much you needed to prevent deficiencies; and b) getting megadoses of one B vitamin could cause deficiencies of the others, since B vitamins are used to metabolize each other. If you get too much of one, it uses up all of your supply of the others. So why don’t Mark and I have beriberi (thiamin deficiency), since we get a lot more of the other Bs than of thiamin? Is it that the RDAs are wrong because they don’t take into account the interactions of multiple vitamins? Or is it that vitamins that occur naturally in food are harder to overdose on somehow? Can’t tell you how much your site has encouraged me and helped change my eating habits. This post in particular I found helpful, with the introduction of Fitday– an application I’m now using. Thanks! We are so glad to hear we could help in any way! Keep up the great work and if you have any questions or need any help either bring it to our comment boards for all of our informed readers to weigh in on or contact us directly by clicking “Ask Anything!” at the top right of the page and sending us an email. Thanks again! 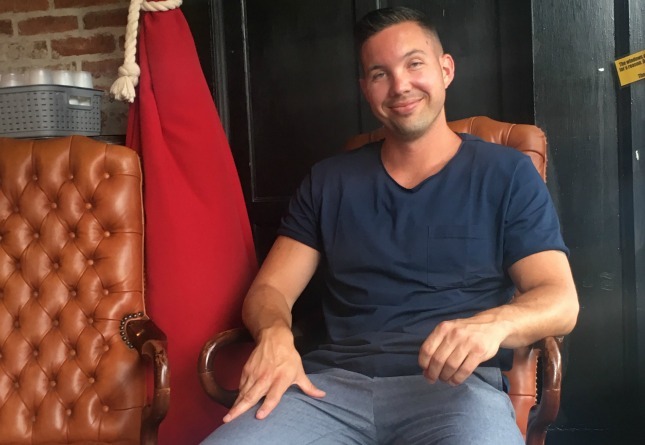 I’ve been looming around your blog a bit recently while converting my diet to paleo/primal and I have a question regarding your protein spacing. At what intervals do you eat this protein (assuming that the 8 servings of steak you show there isn’t consumed in one meal). I’ve often read that anything over 30-35g (for someone your size) in one sitting is just excreted through urine. I too am around 165 pounds and am very interested in the maintaining (as well as continuing to gain) muscle mass when on the primal diet. Thanks so much for this great blog and I look forward to hearing from you. I don’t measure protein and I don’t space intervals really. I eat what I want when I’m hungry…or not. Might be a whole chicken some nights, might be a small steak others, or nothing. Low carbbing means never having to count protein or fat (except to be sure you are getting enough – and that happens intuitively after a while). The whole 35 grams thing has more to do with the idea that you can’t assimilate more that that at one meal. But you can certainly digest it and probably convert some to glucose. I guess what I’m asking is spacing 160 grams of protein over about 4-5 meals (when you’re hungry, of course) better (or more efficient) than consuming that protein in three meals of 50 some-odd grams each when working out hard (intense, under 40 minutes, multi-joint exercises) and trying to build muscle. I’m not worried about counting calories, but rather making sure I am getting enough protein daily and utilizing that protein as efficiently as possible for my muscles. Or maybe I’m just having trouble transitioning from a 6 meals a day, 30 grams of protein each meal to a relaxed “eat when hungry, however much you want” type of diet. I do think I’m over-thinking it, but unless I put at least some structure into my diet I find myself not getting the 160 grams needed (from what I’ve read) to keep growing muscle. There is a danger of overthinking this. The reality is that at 165 pounds, you probably only need 100 grams protein a day to sustain or even to build. More is OK, but not necessary. Less is OK some days. A 50-gram meal here or there won’t hurt, nor will a 20 gram meal. Go for w weekly average instead of a daily average. Remember, If your power-to-weight ratio is good and your body fat low, you may be already at ideal. Adding more muscle may just be too difficult and metabolically expensive. Thanks Mark. Your website is a fountain of knowledge, I can’t believe you find time to update daily. Great thinking, Jedidja. I’ll add it the list. Thanks! I use MyNetDiary.com – I really like it’s layout and how it updates to the server immediately. It’s fast and gives me concise or detailed and customizable reports! Love it! I’ve been wondering some things mark, if you would be so kind as to help me understand them? Also, it seems IFing or only eating 1 or 2 meals a day is very primal. 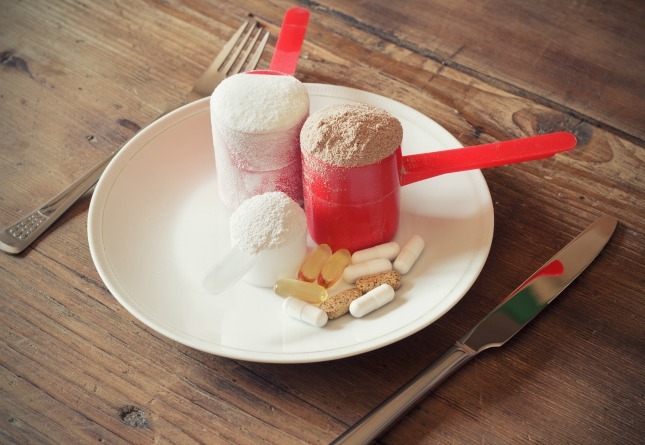 If you eat one meal in the evening – thus eating all your protein in one go, is alot of it wasted? Can one still build muscle eating this way? Kady, the body makes up to 200 grams glucose per day on a zero carb diet. Much of the detail is in the Primal Blueprint book. You noted that you don’t reach the RDA of Vitamin D and Calcium, above. Keep in mind that the RDA’s are silly – you only need 1200 of calcium per day if you are also eating things that damage the gut lining, like grains, which contain antinutrients that make absorbing calcium and magnesium more difficult because they damage the gut lining. If your diet is squeaky-clean paleo, you don’t need as much of those minerals/vitamins – you aren’t eating grains, (much) dairy, legumes, and other foods that irritate the intestinal tract and worsen your abilities to absorb nutrients. Mat Lalonde and Robb Wolf talk about this sometimes on their respective podcasts/blogs/webinars/websites. Chris, you pose a complex series of questions, all somewhat dependent on the answers to each other. First, 4-5 % body fat is extremely low and not something I would advise for extended periods of time. Dont’ get me wrong, I’m not saying you’re not there, but most people who think they are 4% are somewhat higher. If you did try to keep to a legit 4-5%, then you’d need to either keep carbs on the lower limits of ketosis all the time and/or ramp up the expenditure (glycogen depletion) daily. Also, I’m not a fan of working out hard every day. When you’re young you can do it, but it’s not sustainable over your life – and has drawbacks. If you do choose to work out hard every day, then you need refill glycogen stores or you WILL tap into muscle mass. But figuring out how much carb refill you need becomes a more complex equation IF you are trying to keep 4-5% body fat. Bottom line, you can do it, but WHY???? What’s wrong with staying at 6-8% and dieting down to 4% for photoshoots, etc, if that’s your intent? I guess I should have said I don’t necessarily want to be 4-5% year round. I agree that 6-8% would probably be the best fit for year round maintenance. I guess the real question is how low of a body fat percentage can be maintained without sacrificing performance or sacrificing your body’s normal biological functions? I suppose with anything though there is a high degree of variability. Am I missing something? At 4 cals/gram, how does 91g of carbs add up to only 248 calories? Taylor, there’s 29 grams of fiber. No calories in those. Hmmm, so should I be trying to keep my total carbs below 80g/day for fat loss? Or just net carbs? Great post. I think we should keep in mind that the RDA is not actually based on much science, so taking supplements to reach an artificially stipulated number isn’t necessarily necessary. Right? Hi everybody, I’ve been primal for a couple of days now and yesterday I discovered this post so I started using DailyFit to track down my intake. So my first breakdown of macronutrients looks as follows: 2417 calories, 67% fats (187,3 g), 15% carbs (97,7 g), 15% proteins (92,3 g) and 3% Alcohol (1 OZ Single Malt). The %RDA of 95% of the nutrients is met. 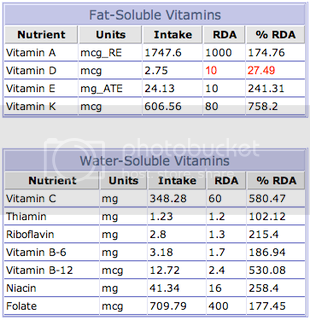 My question is, are these ratios ok, considered that i get enough nutriton? Or, should I eat less fats (65% seems to be quite high, also compared to the intake of Mark)? thanks in advance for your support!